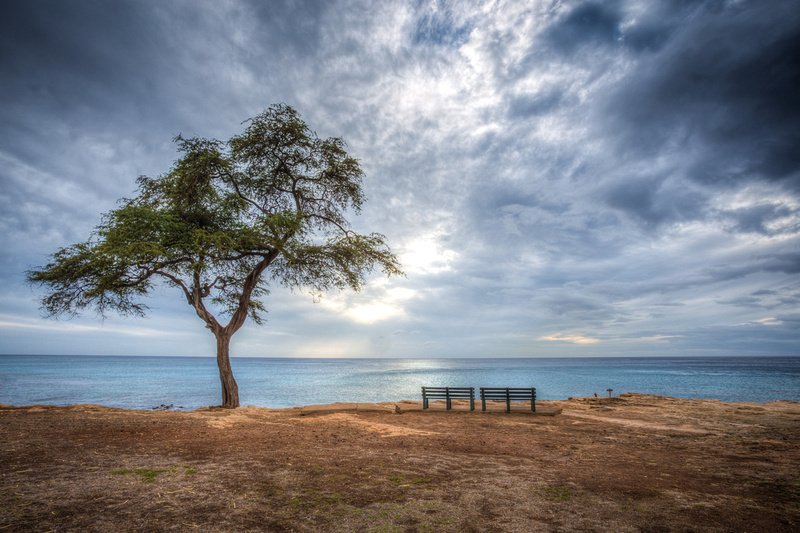 On the island of O’ahu, on the West Coast, are these two benches that overlook the Pacific Ocean. I guess there is not much between them and Australia! There were people snorkeling and scuba diving off the shore here and we could see loads of coral from where we were standing so I bet there was a lot to see underwater. This was our last day in Hawaii and we decided to go for a drive and kinda randomly headed in this direction. The views were spectacular even though the sunset turned out to be quite whimpy, virtually no color. Quite a shame as the cloud cover was just fantastic and would have made a great spectacle if the sky would just have some color. Just goes to show how you can never predict what Mother Nature has in stock for you. Sigh . . . . I guess I’ll just have to go back one day to try again . . . This entry was posted in Hawaii, Oahu, Travel. A wonderful hdr work! I like it!! 1.) When you post one picture, Please Award Two other pictures with-in the first page. 2.) If You Have Time To Post, You Have Time To Award. 3.) Please don’t post a picture then leave without awarding other pictures that deserve an award. For All Sunset Lovers – Post Your Finest Pictures Here. This is an ( HDR & TEXTURED PICTURES GROUP ), for all types of photos. We like all People, Places, and Things. Just Remember, HAVE FUN. You are invited to post this photo.